Purists will say that no less than a 16 oz. 8 yard wool kilt, sewn by hand by a skilled kilt maker in Scotland or equivalent place will do. But that’s a bad advice, at least unconsidered. What YOU and others need must always be reflected by the intended use. If you are going to wear your kilt at weddings and anniversaries only they might be right. And if all of your business suits are labelled Armani, Ermenegildo Zegna or the like, and your jeans Hugo Boss, they are probably too. Otherwise, talking frequent casual wear in your spare time, they are not. It is overkill. Spend £60 and you’ll have an imported 8 yard heavyweight PV/acrylic 24” (61 cm) long off-the-peg kilt. You can get kilts cheaper than that, and some might be good. But chances are they are not. Most off-the-pg kilts come from Pakistan. In the city of Sialkot there simply are a lot of enterprises making and selling kilts to vendors, primarily in Scotland and the USA. These are nice kilts. They are not for formal wear, but neither is a pair of Hugo Boss jeans. For shopping grocery, going to the shopping mall a Saturday morning, going sightseeing in a metropole and having a lunch, walking in the wood, in the hills or along the coast such kilts are perfect. They are not made with the same precision as are expensive kilts. The pleats may not be as sharp as on a wool kilt. But this is nothing that will lay you down, if wearing one. A disadvantage is that the 24” kilt length must fit you. And that only a few tartans are available. But you’ll certainly get a lot of value for money. And for many men an affordable kilt is the condition for starting kilt wearing, something kilt makers should think of, before they claim that these cheap kilts are garbage. They are not. On the contrary, they may help keeping the kilt market alive and growing. I shouldn’t like being without my made-to-measure kilts, but neither I should want to live without my cheap off-the-peg kilts. Each at its time. with outlets in London sells a 2 yard woollen kilt at £149. Two yards aren’t much, but the kilt looks and feels good. I have tried one on. It is available in only one tartan, Stewart Royal, and in solid black. The price is £149. £135 is the price for the Essential Scotweb Casual Kilt. It is a five yard kilt, what shall feel better on a hot day than 8 yards. You can have it any waist size and length you want. And the British made PV-fabric is of a better quality than the ones used for imported kilts. According to Scotweb it is “ideal for more casual occasions or for sporting events”. The kilt is washable and comes in no less than 120 tartans. will deliver you a very nice 5 yard wool kilt in hundreds of different tartans made to your measures, and at prices between £230 and £350, depending on the tartan. (Kilt Society 5 yard custom made kilts). The same kilt in 8 yards (Kilt Society Traditional 8 yard custom made kilts) will set you back at least £350 and prices go to £540. The good thing about Kilt Society is that you can actually have a 5 yard kilt for £230 and an 8 yard for £350. With some kilt vendors the starting price seems to be pure theory. Both are kilts you can wear to the best restaurants, to the opera house and concert hall. The 8 yard version might be a little too much for casual wear (my opinion), but the 5 yard is perfect for almost every task, except for working in the back yard and the like. Other vendors: Heritage of Scotland, The Scotland Kilt Company, Scotweb. Most of my kilts are 5 yard wool kilt made to measure. It is a four yard kilt, made to your measures. The fabric is British made fine PV and the sewing quality is excellent. Delivered at your door step it shall be more expensive than the equivalent Scotweb Casual Kilt, however. I have a USA Casual and I like it very much. As it is closed by means of Velcro instead of straps and buckles it has no metal parts, making it the perfect choice if you have to pass through airport security. I have been wearing my USA Kilts Casual on several airplanes. Californian based Sport Kilt makes light weight kilts for men, women and children. The Sport Kilt Original is only 8 oz. And the fabric seems to be cotton. The price is $69.50 for the basic kilt in size Large. But then you can add a lot of features, like sewn down pleats (what you definitely should) but everything you add to the basic product shall cost you. The sewn-down-pleats make the price go up to $81.50. The standard length is 22.5” but you can have it shorter or longer. I have a Sport Kilt. Mine is with sewn down pleats, invisible deep slide pockets (which should certainly be standard in all kilts 2019), fringes, and belt loops. The thin fabric makes it a dream to wear under Southern European sun. Like the USA Kilts Casual the Sport Kilt is closed by Velcro. But you can have straps and buckles should you want to. 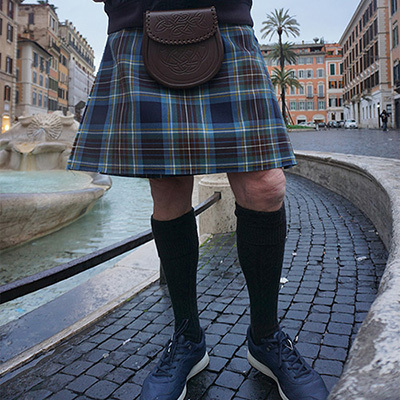 For informal occasions where you might otherwise feel comfortable in shorts, the Sport Kilt Original is great – provided you don’t expect it to be a traditional kilt. It’s an unpretentious kilted garment of its own and for the mentioned purposes I can highly recommend it, even if freight and taxes double up the price when sent to Europe. 70 tartans are to choose. How do I get my first kilt? Take a flight to Edinburgh. It is a beautiful city. There are so many options. More likely it is, however, that you'll be ordering it on the internet, especially if you are going to have it made-to-measure. What about shipment cost, taxes and VAT? If you are an EU-resident and your vendor is inside EU too, you’ll simply pay the price including VAT plus freight. A casual kilt, £50 + freight £15 = £65. A kilt made to measure, £230 + freight £ 15 = £245. Kilts are primarily coming from Scotland and it shall depend on the Brexit agreement, whether it can go on this way, or UK is to be treated like a non-EU country. If so it gets more complicated - and more expensive. To the price of the kilt ex VAT (when applicable) you have to add shipment cost. If the sum of kilt price and shipment cost exceeds the equal of approx. 150 EUR you must pay 12% import duty tax of this total. VAT of the importing country always applies and it is to be calculated on price of kilt, shipment, and duty tax. Finally a customs clearance fee is added. Could be about 20 EUR or £18. A casual off-the-peg kilt, £50 + freight £15. Had the same kilts been sent from USA or Canada, there had been no VAT to deduct, and freight had been £50 rather than £15. We think kilts have a place in just about any situation. They're particularly great for occasions when you need a little extra freedom of movement, like when hiking or driving long distances. Both within and outside of Scotland, you'll find men in kilts on the street, in the pub, and even at work. We've heard from lorry drivers to university professors who make the kilt part of their daily uniform. We say it can be worn at any job except mountaineers or firemen because - after all - the higher you climb, the better the view! Our best tip is that you can dress down your kilt and wear it wherever you would wear a nice pair of jeans." Decision #1 WHICH TYPE OF KILT? On Kilt Society's opening page you’ll have the choice between their £50 off-the–peg, 8 yard heavy weight Essential kilt, and their custom made kilts, either in 8 yard costing £350-540 (depending on tartan) or 5 yard £230-350. You may start taking a look at the various possibilities. Here we settle for a KILT SOCIETY 5 yard custom made kilt. But there shall for each decision also be references to the off-the-peg kilt. You could now be just five easy steps from having ordered a very nice kilt. You’ll see the price £230. It shall probably change when you decide for a tartan. Click “Select your tartan” and up comes a table with the alphabet. “Find your tartan”, it is called. Well, if you have no idea of what tartan you are looking for, and you probably haven’t if you are a first time kilt buyer, you might just start with A and go on to see what is behind. There are several tartans to choose. A rather popular one is Anderson Modern. Click it and you’ll have six possibilities, the cheapest one being Marton Mills 16 oz. which shall add £20 to the price of the kilt. From Lochcarron you can choose between a 13 oz. tartan at £30 extra and a 16. oz. at £70. A Strahtmore in 13 oz. is additional £55 to the basic price, and if you go for one of the two from House of Edgar you’ll have to pay either £70 on top for the 16 oz. or, against what was to expect, £120 for for the thinner 13 oz. tartan. You’ll also notice that the colours are not quite the same. And the explanation might not just be due to the reproduction of the tartans. It is not unususal that they are different from mill to mill. Others are Stewart Black, MacGregor Red, and Caledonia, just to mention a few. A traditional kilt is supposed to sit about navel (your “natural” waist), i.e. higher than most trousers. A casual kilt can be worn lower, however. Take your measure where you want your kilt to sit. Don’t rely on your trouser size! The clothing industry is pleasing their customers by lying about facts. My Tommy Hilfiger jeans waist size is 32” but my kilt waist is 36”! A kilt being fastened by means of straps and buckles means there is some flexibility, like plus/minus 1 inch. On off-the-peg kilts the flexibility might be even bigger, like for example 34”-38” = 10 cm. The Kilt Society Essential kilt comes in five waist sizes, 30-34”, 34-38”, 38-42”, 42-46”, and 46-50”. With other vendors it is sometimes called hip size. It is where you are at the broadest. Take a lose measurement. When buying a readymade kilt you are never asked. Then the seat size is based upon the waist size. The kilt should at the longest end at the middle of your knee cap. By no means should it cover your knees – even if that not uncommon. At the very shortest it should be one inch above the knee. That means a give and take of about five cm or two inches. I have never been able to use the "kneeling" method" often referred to. My advice: Use a camera or your smartphone, a towel and a belt. The phone or camera should be placed in a vertical position, meaning parallel to the wall and in knee height. With the belt at navel – or where you should like to fasten your kilt – adjust the towel to the 24” standard length. With you standing upright (like with your back against the wall) take the picture with the self-timer. If not satisfied adjust the length of the towel until it looks right on the photo and take the measure. You might also use the smartphone on a selfie stick. Just NEVER lean forward to take the picture! Another way is to have your wife or girlfriend assist you. But why not just order a cheap 24” kilt to see whether the length fits you or not. If not, you can return it and have your money back. Or, if too long, a seamstress can shorten it. It is a good and cheap way also to feel more assure when you order your next and probably more expensive kilt. And for a lot of tasks that cheap kilt is just right. Placed at navel a 24” kilt goes to the middle of my knee cap. In my case this length is the absolute maximum. 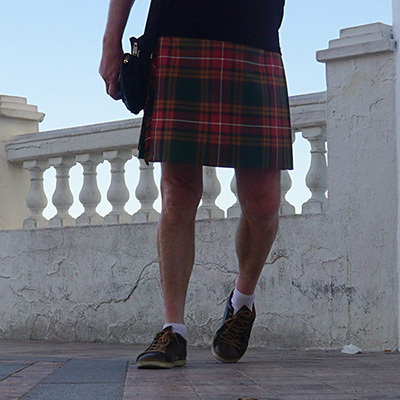 A 21” kilt resting on my hips comes to about one inch above my knee cap, thereby still just acceptable. Fastened at navel it should look more like a mini kilt, however. The perfect kilt length is for me 22.5"-23”. This just to indicate that there is some flexibility – and come in mind we are talking casual kilt wearing, not national dress. I’m 176 cm tall. For me, better too short a kilt than too long. J. Charles Thompson: So you are going to wear the kilt, 3rd revised edition 1989, Lang Syne Publishers LTD, Glasgow."" Not all vendors will ask. You are supposed to give your height in feet and inches. It is just to give an impression whether the length you have ordered seems correct. Varying by 2.54 cm it is not a very precise indicator, but if you order it 20” (51 cm) short and your height is 6’9” (206 cm) you might be asked whether you really want it to be a micro kilt? 1 foot (1 ft. or 1’) = 12 in. = 30.48 cm. Being 176 cm tall I’m at the closest to 69 inches (176/2.54). That means 5 feet (69/12) + 9 inches. Want that kilt, add it to your cart and proceed to check out. Thereafter wait 6-8 weeks for it to arrive. It is not that difficult to get a kilt in appropriate length. 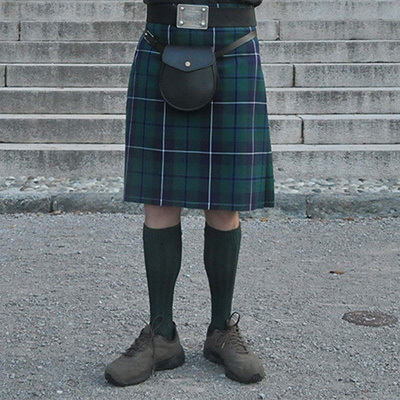 Below six kilts ranging from 24" down to 20", meaning a difference of no less than 10 centimeters, and five of them can be worn without harming norms. Too long. Kilt covering the knees. If worn higher OK. 24" 8 Yard PV ready-made kilt. Pretty bad quality. MacKenzie tartan. Top of knee cap. The kilt length I prefer. 22.5" 5 yard wool kilt made-to-measure. Campbell Ancient tartan. One inch above the knee. Better no shorter than this. 22" 4 yard PV off-the-peg kilt. Holyrood tartan. Two inches above the knee. Two short, if worn at natural waist. When lowered it is just within limits. 21" 4 yard PV off-the-peg kilt. Buchanan Antique tartan. A cheap 5 yard made-to-measure-in-Pakistan PV kilt, 20". Ordered from an American vendor. Stewart Black tartan. 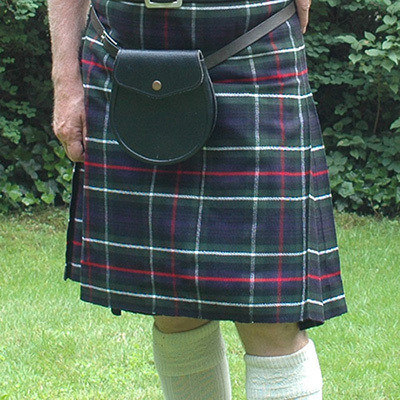 Three inches above the knee, the length, before mentioned J. Charles Thompson finds still acceptable for a kilt, "especially for outdoor sports". I think most men should think it is definitely too short for a kilt to be, even if it should be worn as low a it could. And a warning. In countries where school uniforms are common, a kilt that short might be considered schoolgirl's wear.